Cooper Tire Company announced the recall of nearly 300,000 Copper Tires due to slow leaks or cracks in the sidewalls of these Cooper Tires. This latest Cooper tire recall was necessary to prevent sudden tire failure, tire tread separation and other tire failures that could result in an accident or tire related rollover accident. If a Cooper tire looses air due to a defect, then the temperature in the tire increases, resulting in an even more dangerous condition. The Cooper tire recall includes over 180,000 tires from the Albany Plant. The additional recalled Cooper tires were from other Cooper tire plants through the United States. These Cooper tires are being recalled due to sidewall cracking and were manufactured between November 2004 and July 2005. As with this Cooper tire recall, it is possible that additional tires models may be added if additional Cooper Tires are found to be defective as well. 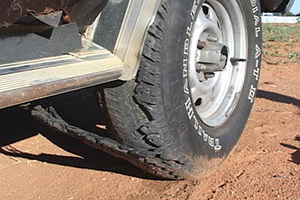 If you or a member of your family has been seriously injured or a loved one killed in a rollover or accident, in which may have been caused in part to a Cooper tire failure or Cooper tire tread separation, then call us to discuss this matter with nationally recognized trial lawyers experienced with tire tread defects and tire tread separation lawsuits. For a Free & Confidential Tire Defect Case Consultation Click Here or if you prefer, call and talk personally with an Attorney/ Lawyer at the Willis Law Firm at 1-800-883-9858.